Eggplant has nothing to do with eggs - unless you dip and bread them. This sauce is a knockout! We grow 'Casper', an heirloom small, long white eggplant. It's mild in flavor and perfectly suited to thick, rich vegetable sauces. When cut into dime-to-quarter-sized disks, I have found Casper to be a perfect addition to other late summer produce. So I developed the following sauce for pasta and rice dishes. It is also perfectly delicious on toast points as an appetizer, even as a side dish.. 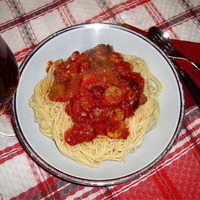 It may remind you of a ratatouille puttanesca, or any number of other combinations - but I would urge you to give this recipe a try. Whatever you want to call it - it is very delicious! While you may not grow or have Farmer's Market access to Casper, you may find that another variety of small, or baby eggplant will carry this recipe well. I have also had great success with baby Japanese eggplants as a vehicle for this recipe. However, I will be increasing our crop of Casper next year! Casper is now haunting the "what else can I make" section of my mind. We do make our own Roma tomato sauce base, which, like your canned, diced tomatoes, needs to be reduced. It is also not our custom here to drown any pasta dish in sauce, which happens all too frequently, but to coat and bring flavor to the pasta. But right now, let's make a winning multi-purpose sauce. What a fabulous looking recipe. I love the idea of eggplant and olives. And it looks easy to make as we..
We had this three nights ago and it was delicious. The key is to have great tomatoes. The sauce lives or dies by the tomatoes. If you can't find good fresh ones, buy a high quality canned Italian tomato. I want to try this on polenta! Awesome recipe. so good to try. I like pasta and learning new tricks is wonderful. Eggplant adds such body to sauces . I love this version. Maybe over spaghetti squash? The eggplant sounds so deelish and the color is gorgeous!! It is an excellent - and versatile - dish. You can even use this recipe as a stuffing for a baked butternut squash. Just grate a little extra cheese on top during the last 15 minutes of baking the squash. Thanks so much for your kind comment, Malli! This looks fantastic, Amos! I'm adding this to my try soon list. Looking forward to having it sometime next month. Thanks for adding! Judee - it tasts even better than it sounds. No matter how you use it, your guests will love it! Hi, Thom - You can also add zucchini of the same size as the eggplant to this recipe - 12/ & 1/2, and enjoy even more varied texture and flavor. Hi, Marie - I also prefer the smaller white eggpant, particularly for this type of dish, or to make a sweet pickle. I am very happy to have caught your eye and hope to have you try some of my other postings - we do a pretty good number of dishes using GF flours, so try the cornbread (a real easy, super tasty & nutritious recipe), or the carrot cake recipe - that one never fails when I offer it. Stay in touch. I commend your good taste in vegetables, Arturo! So few people appreciate the eggplant, or aubergine, unless one is from a culture that KNOWS how versatile and delicious this vegetable is. They come in many varieties and shapes, even external colorations. But they are all delicious when married to a fine recipe. The cheese in this recipe acts as a wonderful binder and does so much more than just flavor the sauce. I am anxious for you to try this recipe and get back to me with your comments. If you have difficulty obtaining the Nicoise olives, I would recommend very well-rinsed Gaetas. Watch the salt, however. Thanks for your comment!